After months of leaks and speculation, Google has today announced its Google Pixel 3 and Pixel 3 XL flagship smartphones. The devices are pretty much exactly what we thought they were: a pair of well-specced premium Android phones made by Google itself, with slightly revamped external designs, iterative updates across the board, and powered by best-in-class software. Just like the last two years, the Google Pixel 3 and 3 XL are launching today with identical internal specs and slightly different external appearances. The larger of the two phones, the Google Pixel 3 XL, will of course have its overall larger size (hence the XL name), a bottom chin that’s almost identical to last year’s phone, and the infamous display cutout. The smaller Google Pixel 3 is sticking with a more traditional look with rounded corners a la the Pixel 2 XL. The Google Pixel’s signature aesthetics and features are back again this year. Google’s “glass window” is located around back (this time with a more “artificial” cut out because the back is all-glass), both phones mark the return of squeezable sides, there’s the Pixel Imprint fingerprint sensor on the back, and once again, you should expect some of the best cameras in the smartphone space. In fact, the camera — specifically the front-facing one — is one of the most obvious changes this year. The Google Pixel 3 XL has a large front cutout to hold not one but two front-facing sensors, one of which is a wide-angle lens. We already detailed all the new camera features Google’s introducing with the Pixel 3. Google Pixel 3 camera brings a new AI-powered ‘Top Shot’ feature that will take a bunch of photos and use AI to point you toward the best ones. 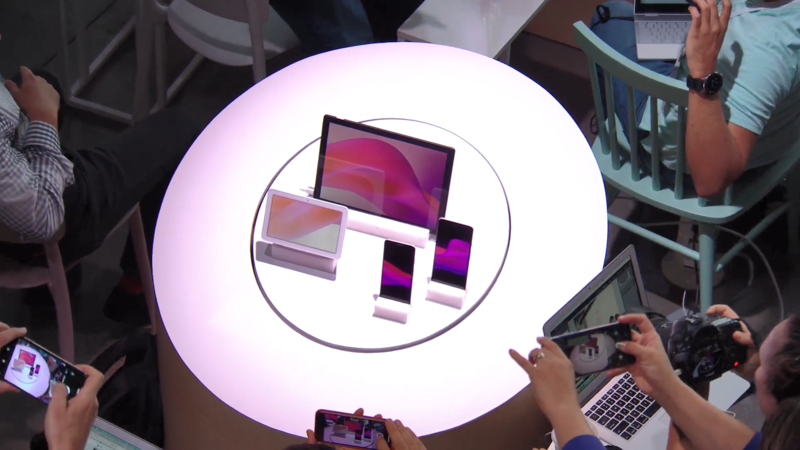 The device is also packing a Google Clips-like ‘Photobooth’ feature that will let you dock your phone somewhere to capture a bunch of photos hands-free. There’s also a Super Res Zoom feature launching with the Google Pixel 3 and 3 XL, which is an AI-powered zoom. The back will house the standard single shooter we’ve seen for the last two years, but keep in mind that most of the camera prowess on the Pixel is due to computational photography. On the specs front, these two phones are business-as-usual for 2018 Android flagships. Both phones will have a Qualcomm Snapdragon 845, an Adreno 630 GPU, 4GB of RAM, 64GB or 128GB of storage, decent-sized batteries, good — albeit very different — displays, Pixel Visual Core, the usual WiFi, NFC, GPS, eSIM, and other interfaces, and more. The biggest selling point for the Pixel phones has long been their software, and that’s not changing here. You’ll get Android 9 Pie and Google’s infusion of AI features everywhere. The phones come in 3 colors: Just Black, Clearly White, and Not Pink. They’re going to go up for pre-order immediately following the 10/9 event, and now we have pricing. On Project Fi, the Pixel will start at $799, and the Pixel 3 XL will start at $899. Google says YouTube Music comes with Pixel 3 for free for 6 months. 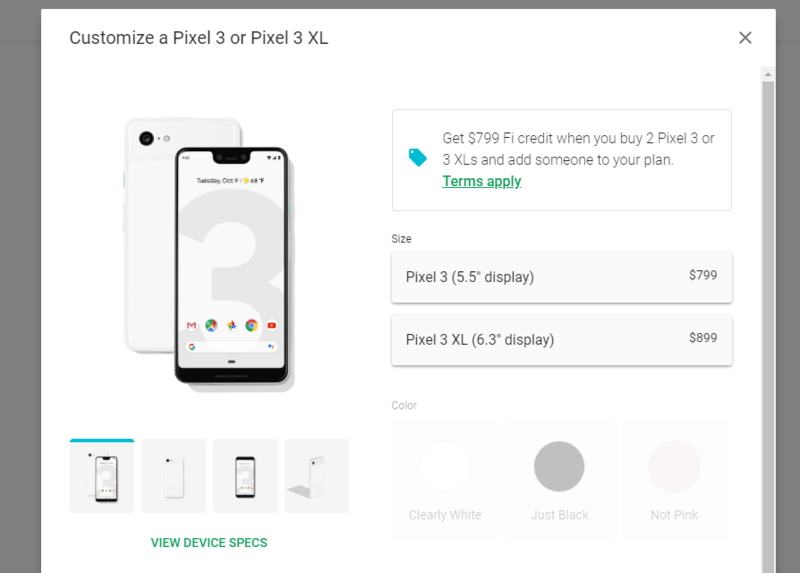 Google Pixel 3 and 3 XL ship October 17th according to the Google Store.